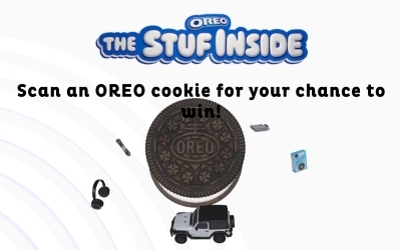 Enter daily for a chance to win the Oreo (The Stuf Inside) Instant Win Game and Sweepstakes. There will be 1,069,062 random, computer generated winning times, one (1) prize type per day during the Promotion Period. Follow the link below to enter the site, register and twist open the cookie on your screen to find out if you’re a winner. Ends at 11:59 pm ET on March 6, 2019.
age or older at the time of entry.